Uniben 2017/2018 Post UTME form is out. 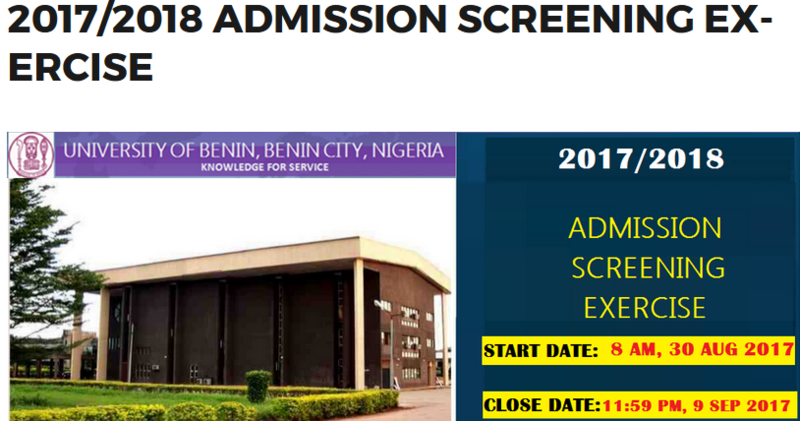 The University of Benin (UNIBEN) wishes to inform candidates seeking Admission into the University that Admission Screening Exercise for 2017/2018 Academic Session will take place between 14th September, 2017and 25th September, 2017 in designated centres within the Ugbowo Campus of the University. The Screening Exercise shall be conducted using the Computer Based Test (CBT) mode. All candidates are expected to be seated, latest one hour before the stipulated time for their screening exercise. Note: Only candidates who applied through JAMB for the 2017/2018 UTME Admission and chose University of Benin as First Choice and scored 200 and above are eligible for this Screening Exercise. Read now: 2016/2017 UNN Nsukka Admission Cut-off Mark – complete list! Enter your Surname exactly as written on the JAMB Registration slip and your JAMB Registration Number immediately, your ID and Password will be displayed on the browser. On the https://uniben.waeup.orgclick on ‘Login’ (top right of front page). Upload a RECENT and CLEAR “1×1” COLOUR PASSPORT PHOTOGRAPH WITH RED BACKGROUND INJPEG FORMAT ONLY. Great care should also be taken to follow the specified formats on the UNIBEN website and portal. NOTE that the photograph uploaded will be the only valid ID for all admitted candidates throughout their stay in the University of Benin. FAILURE TO UPLOAD THESPECIFIED PASSPORT PHOTOGRAPH WILL LEAD TO DISQUALIFICATION and failure/forfeiture of admission. Candidates should go back on-line on 12 September, 2017 to check for their specific Day, Venue and Time for the Screening. Application website closes by 9th September 2017. All applications must be concluded online not later than 9th September 2017). Candidates, who pay after the deadline of Midnight 9th September 2017, will not be screened. I wish all the candidates the best!